Kitale, Kenya, April 2013. Length is about 5 mm. 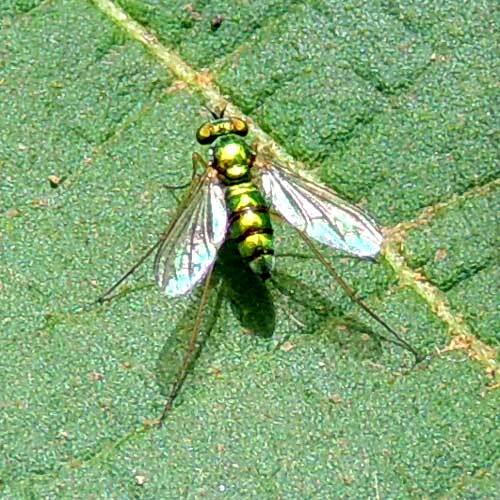 From Wikipedia: the long-legged flies, make up a large family of true flies with more than 7,000 described species in about 230 genera distributed worldwide. The genus Dolichopus is the most speciose, with some 600 species. They are generally small flies with large, prominent eyes and a metallic cast to their appearance, though considerable variation is observed. Most have long legs, though some do not. The adults are predatory on other small animals.